During my time in Scandinavia, I've picked up more than a few outfit pointers from stylish Danish, Swedish, and Norwegian women. Overall, they've inspired me to be bolder and more creative with my outfits. What does that mean exactly? For starters, I began swapping basic outerwear pieces for livelier versions, like a shimmering metallic coat or a puff-sleeve plaid topper. I've also learned to not rely on my blue jeans so often and experiment with the color wheel a bit more. Scroll down to learn the wardrobe changes I've made inspired by Scandinavian style. My go-to blue jeans are a crutch I lean on almost every day, but Scandinavian girls love a good trouser look. I'm now more willing to swap straight-leg denim for wide-leg pants in fun fabrics like velvet or silk. I've been inspired to experiment not just with color but also with fabrics. When you invest in something more adventurous, you might be worried that you won't wear it as often, but Scandinavian women aren't afraid to turn some heads. So go on and wear it every single day if you feel like it. Yes, black and white will always be a foolproof color combo, but Scandinavia has inspired me to have fun with different color mixes. I particularly like the tonal trend, which is combining different shades of the same color family. In Copenhagen last May, I tried this out with different hues of pink and was hooked. Living in Los Angeles, I'm used to driving everywhere and not needing to wear shoes that are actually practical. But when I travel to Scandinavia, I know I'll be doing a lot more walking, so I always pack sneakers or low boots, even if I'm attending a dressier event. 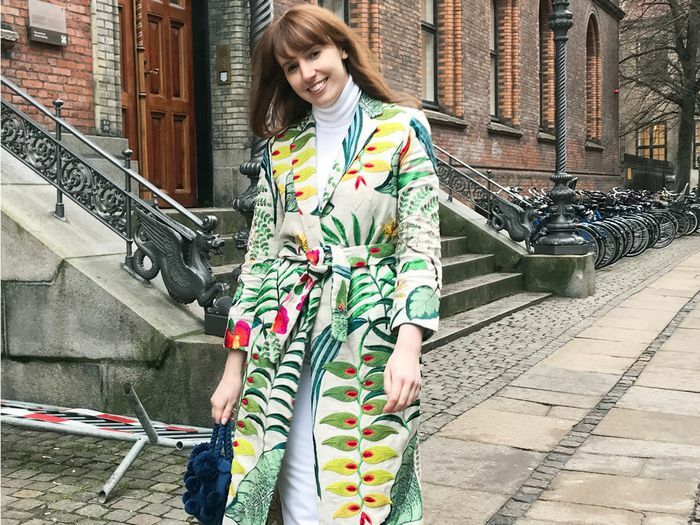 Next, the top seven trends from Copenhagen Fashion Week brands.